The British Horseracing Authority (BHA) have announced a "risk-managed return to racing" will take place from Wednesday following a six-day shutdown because of equine influenza. Racing in Britain, which has been on hold since Thursday, will resume with two jump meetings at Musselburgh and Plumpton, alongside the all-weather fixtures at Southwell and Kempton. The sport was rocked last Wednesday after three cases of the highly-contagious virus - subsequently rising to six - were identified at the yard of Grand National-winning trainer Donald McCain in Cheshire. Hopes of a resumption this week appeared to fade on Sunday night when it was revealed four further positive tests had been discovered at Simon Crisford's stable in Newmarket. But the BHA said in a statement on Monday night: "After consultation with its veterinary committee, and based on the latest tests conducted by the Animal Health Trust, the BHA's chief regulatory officer, Brant Dunshea, tonight confirmed that racing could resume, but only with strict biosecurity controls in place. "This decision to return racing in a controlled, risk-managed manner was unanimously supported by the industry veterinary committee." The ban on British-trained horses running in Ireland during the outbreak of equine influenza was lifted earlier on Monday by the Irish Horseracing Regulatory board. The clerk of the course at Newbury, Keith Otteson, says the ongoing equine flu outbreak has already cost the UK economy millions of pounds. The BHA has also ordered that no entries or declarations will be accepted from horses that have not been vaccinated in the previous six months and all trainers will be required to provide a health declaration at the racecourse. 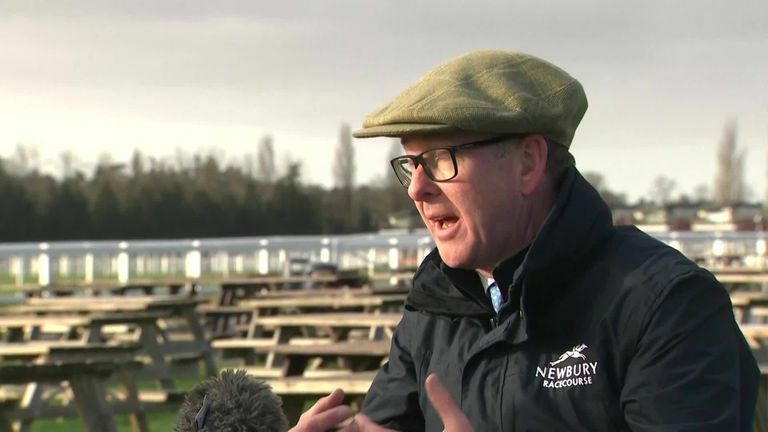 "We have developed a risk model, which the veterinary committee support, in order to assist the return to racing," the BHA's Director of Equine Health and Welfare, David Sykes, said. "We will observe closely those horses who are taken to the racecourse and will intervene as a precaution to prevent a horse running or accessing a racecourse if we believe it might put other horses at risk of infection." The Denman Chase at Newbury, which was due to include 2018 Cheltenham Gold Cup winner Native River, was cancelled last weekend and has now been rescheduled for Saturday at Ascot, along with the Betfair Hurdle. Major weekend cards are scheduled for Ascot, where the Betfair Ascot Chase is part of a now nine-race card, Haydock, which will host the William Hill Grand National Trial, and Wincanton, where the Betway Kingwell Hurdle is the headline attraction.